Take home brewing to the next level – grow your own hops! Home brewing has long been a popular hobby for beer lovers for ages. Last year there was over one million American’s brewing beer at home, according to the American Homebrewers Association. Now some beer enthusiasts are taking the art of creating home brews a step further and are turning to their own gardens to grow one of beer’s key ingredients: hops. “If you enjoy beer, why not take it to another level?” said Paul Fierro, member of the Borderline Brewers club in El Paso, Tex. Hops gives beer its bitter taste and acts as a natural preservative. It is a green, weedy-looking climbing plant trained to grow up strings. Brewers are after the female cone-shaped flowers that hang downward from the vines, which are typically harvested in the late summer and early fall. In 2007, the price of hops significantly increased, and the option of types of hops dwindled. That left many home brewers up to the task of growing their own, said Gary Glass, director of the American Homebrewers Association. 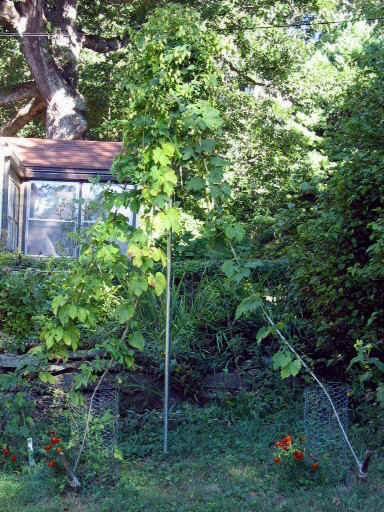 Albert Salinas of El Paso started growing hops in his backyard two years ago. “Your first year will be slow,” said Salinas. “It does take a while for the hops to make the whole root structure to support a plant; but in your second year, I’ve seen them grow up to six inches in a day,” added Salinas. As a result hops vines require a lot of space for growth, but with a little sunlight and TLC, they’re not too hard to plant and can be raised in almost any climate. Salinas has experienced success in the Chihuahuan Desert of El Paso, Tex., but he said in warmer climates, it’s best to plant the hops in a deep mound and water them daily. He also recommended using ground espresso beans to help speed up its growth, as the hop plants like the extra nitrogen.